Close up of the exquisite polished stone axe. Is it a macehead or an axe – Jo initially discovers the axe. First of all, a confession . . .
We confess, here and now, in the presence of thousands of readers of the diary, out there in the archaeosphere, that we have regularly used superlatives to desc artefacts found at the Ness. Now, the slide back into sin. Quite the most beautiful polished stone axe any of us have ever seen has emerged from Structure Fourteen. It is a magnificently coloured, metamorphic rock, bluey-black as a background, interleaved with puffy white clouds of quartz. Looking at it is like lying on your back gazing at a summer sky. Okay, we’ll stop it now, but it was worth every little adjectival flourish. Jo, from Willamette, found it lying on the floor of the structure, just opposite the side entrance. 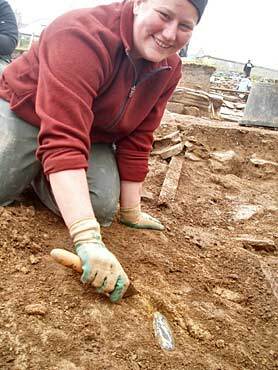 Two weeks ago, she found a magnificent piece of Grooved Ware pot and site director, Nick, told her it would be the best find of her digging career. Jo finally reveals it full extent – it is an axe!. Well, we know site directors are rarely wrong, but in this case he bottomed out in style. Just look at the above photograph and marvel. It has now been removed from site to a place of extreme safety, guarded by dragons. Elsewhere in Structure Fourteen (Hugo and Jim have had a busy day), a secondary hearth turned up in the north-east of the structure. 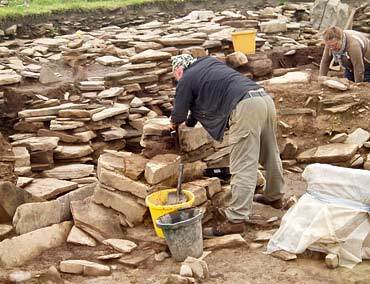 Further investigation of the extensive stone robbing of the north-west wall shows that there are enough basal stones remaining to clearly show the wall-line. In addition, it is clear that most of the floor deposits are also intact, which is great news. Wows all round as Jo triumphantly lifts the axe. In the central midden area, Dave R. and his team are removing the remaining rubble layer and coming down on to many stone roof tiles in the south end of Structure Eight. It cannot be stressed enough how magnificent a find these tiles represent, but, as those who removed them slowly and painstakingly from the other end of the structure in 2010 and 2011 know, they are not fun to excavate. It is, however, good to know that they are there and that it is possible that the whole of the roof is still represented inside the building. In Structure Ten, Sarah is carefully deconstructing (fancy word for taking apart) the remains of the west dresser and not finding any more stone axes. However, Mike, who is similarly deconstructing the north dresser, is hopeful that here too some votive offering may lie hidden under the dresser. Claire and Jan are continuing to confirm the square form with rounded corners of the earlier phase of the structure by following the robber trench. In Structure Twelve, the floor plan is not far away now and it is almost time for a major phase of planning of the interior of the building. Distinguished visitors today include Mike Pitts, the editor of British Archaeology, and Robin McKie, who has written for The Observer newspaper on archaeology for many years and who, we hope, may produce a colour feature in The Observer magazine in future weeks. Here is an early alert. We won’t be digging on Friday, although tours will continue, but everybody will be present on Sunday for our open day (11am to 4pm, with a continuous round of tours). We will be deeply insulted if you don’t all come. Mike dismantles the northern dresser in Structure Ten. My name is Garnet Kwader and I am here with the group of students from Willamette University, in Salem, Oregon. 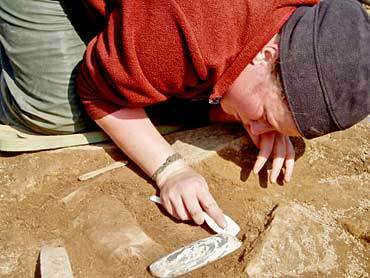 I have spent two years in university studying biology, but when I transferred to WU, at the beginning of last semester, I discovered that Willamette had an archaeology major. I have been fascinated by archaeology since I was very young, but it never seemed like an attainable goal—to me it was always something really neat that other people got to do. I needed more information and finally I was in a position to find it. I went to Scott Pike, one of the archaeology professors at Willamette. Kelsey reveals the second hearth in Structure Fourteen. He told me about the archaeology program at WU, and gave me a brief run-down of job opportunities in the field. He also mentioned the Ness of Brodgar and explained that some students from Willamette were going to excavate there for four weeks this summer. It sounded too good to be true. After a week of stressful deliberation, I decided to throw caution to the wind and delve head-first into the world of archaeology. 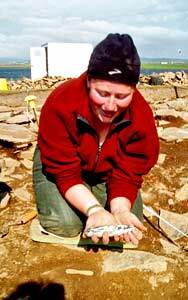 I changed my major to archaeology, with my biology serving as a minor, and I signed up for the summer field school at the Ness of Brodgar. Now here I am. I was terrified to come for fear of arriving and realising that archaeology was really great in books, but awful in reality. Fortunately, this is not the case. In the past four weeks of trowelling, brushing, cleaning, drawing, planning, sampling, finding, and trowelling some more, I still have not found a task I dislike. Whenever I learn a new skill, it becomes my favorite. The director and supervisors are incredibly knowledgeable and always willing to help, as are the more experienced students and volunteers. I have learned more about archaeology in the past four weeks than I ever could have imagined and I hope to be able to return next year and discover some new favorite tasks. 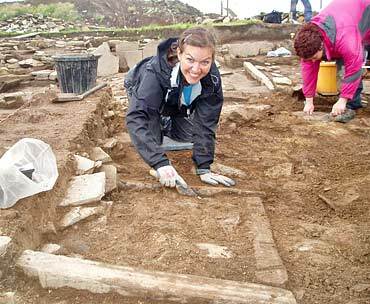 My experience here at the Ness of Brodgar has been a wonderful start to my archaeology career, and it has assured me that archaeology is every bit as fascinating in person as it is on paper.